36th BCS Apply Online 2015. 36th BCS Preliminary Exam will be held on 8th January, 2015. 36th BCS Preliminary Exam Admit Card and Seat Plan Download. 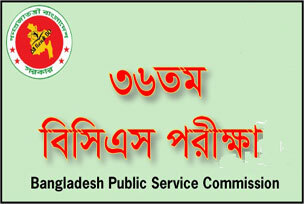 People all around Bangladesh who have a long cherished dream to be appointed as public service officer in government level are requested to pay more attention as 36th BCS Circular has been published on 31st May, 2015. Like the recent past years the candidates have to apply online to enlist themselves for 36 BCS exam. 36th BSC online application will be start on 14th June and it will be continue on 23rd July, 2015. 36 BCS online application will be start from 10:00 AM. As it is the eve of 36th Bangladesh Civil Service (BCS) Exam, here we present relative information including 36th BCS Circular, Syllabus of examination and question pattern for the sake of our viewers. Get 36th BCS application process and 36th BCS online application process 2015. The circular will be published in PDF format. Interested people can easily download the PDF file as soon as it is available in the website. After selecting in preliminary exam the candidates have to face written and Viva to be selected permanently. Application Fee: Application fee is 700 taka for general candidates and 100 taka for physically handicapped or tribal. Age Limit: Age limit is 21 to 30. But freedom fighter’s child will get extra 2 years to apply for 36th BCS Exam. How To Get 36th BCS Preliminary Exam Result? How to recover my 36th BCS password ? When the 36th BCS application fee have to pay then you will get a user ID and password by teletalk return sms. If applicants lost his user ID & password, he can easily recover by SMS. SMS Example : BPSC<Space>HELP<Space>Bord Name Of SSC<Space>SSC Roll No<Space>SSC Passed Year and send this SMS to 16222. Rest of the seats will most probably be fulfilled under general Cadre criteria. Here you can get 36 BCS circular 2015. 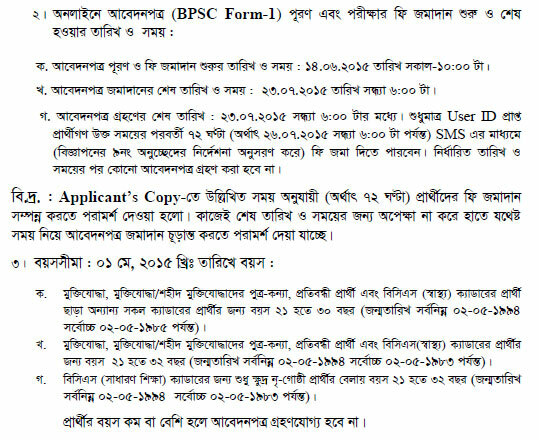 36th BCS Online Application Form Download. 36th BCS Apply Online here.